Is the EU a fair mediator in peace talks between Israel and the PA? NGO Monitor's new analysis shows EU's bias against Israel. The European Union’s High Representative for Foreign Affairs, Federica Mogherini, will arrive for a visit to Israel and the Palestinian Authority on Wednesday, and in advance of that visit, the NGO Monitor group has published an analysis of a key EU policy paper, showing the EU's flawed assessment and understanding of Israeli society. The EU's External Action Service 2014 Israel ENP Progress report, published in March and addressing the EU-Israel relationship as part of the "European Neighborhood Policy," uncritically relies on the claims of political NGOs and all but ignores violence against Israelis, the organization noted. "It is astonishing to see a formal EU document, which is supposed to reflect developments in Israel and help set EU policy, that is so biased," stated Professor Gerald Steinberg, president of NGO Monitor. "Mogherini's visit is an opportunity to begin fixing the failings of EU policy, which, if left uncorrected, will cause serious damage to the EU's credibility in the peace NGO Monitor's analysis indicates that the EU applies different human rights norms and international standards towards Israel, and omits events and terror attacks against Israeli citizens,” he added. The ENP report fails to specifically mention violent attacks against Jewish targets, despite the steep rise in such attacks in 2014. In sharp contrast, the report discusses in detail actions done by individuals or groups that are identified by the EU as "extremist Israelis" or "far-right Jewish groups." The report also wrongfully identifies the Israeli restrictions and Egypt's closing of the smuggling tunnels to Gaza as the "primary obstacle for long-term economic development" in Gaza. “This unsupported claim fails to acknowledge Hamas's violent takeover of Gaza in 2007, continuous terror attacks from Gaza, and the uncontrolled flow of arms that compelled an Israeli response in order to protect civilians from attacks,” noted NGO Monitor. The report does not mention Hamas's grave violations of international law and human rights, including the use of UNRWA facilities, mosques, and hospitals to stockpile weapons and shield combatants. Simultaneously, the report does not address Israel's humanitarian commitment to the so-called "humanitarian windows" (cease fires to transport of civilians to in Israeli hospitals) during military operations, as Hamas repeatedly violated the cease-fires. NGO Monitor also noted that Israel is the only ENP country that has an entire chapter devoted to responsibilities under international law, including other ENP countries involved in territorial disputes and/or armed conflicts. “This deviation from the standard template of ENP reports highlights the EU's singling out of Israel and follows significant lobbying efforts from highly politicized NGOs,” the group said. "Like previous ENP Progress Reports on Israel, the EU relies extensively on material provided by a narrow group of fringe NGOs, resulting in a distorted approach that has affected the reports' content and credibility," added Professor Steinberg. The purpose of Mogherini’s visit is to hold discussions on a possible resumption of long-stalled peace talks between Israel and the PA. 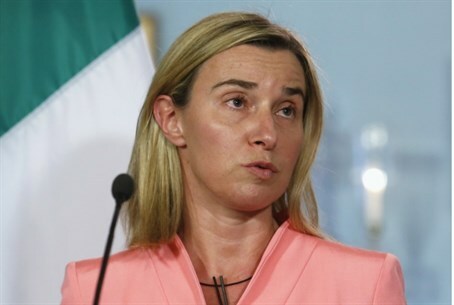 Speaking Monday ahead of her visit, Mogherini indicated that the EU wants a more active role in seeking peace between the sides. "My very early visit has a political meaning," Mogherini told a news conference following an EU foreign ministers' meeting in Brussels where she discussed the Middle East. "The European Union is ready and willing to play a major role in a relaunching of this process on the basis of the two-state solution," she added. Mogherini took over as foreign policy chief for the 28-nation European Union in November and visited Israel and the PA shortly afterwards, saying she wanted to make a priority of pushing forward the Middle East peace process.